Those are absolutely insane times for 1965, Thats faster then Bmws fastest car 40 years later!! Really amazing. There is no 3-speed Cobra 427. I believe the 3.2s 0-30mph is a typo, or even based on the slowest 0-60 result (4.6s as stated in the range). @ Super8: I didn't know that the star of The Cosby Show is a car guy, interesting. Shouldn't it have a 4 speed transmission, actually with that kind of speed, it more likely has a 5 or 6 speed manual. I have Backdraft Cobra.. Rousch 427 with 490 hp and 515 lbs torque. @ Capn Quick ; Thanks . 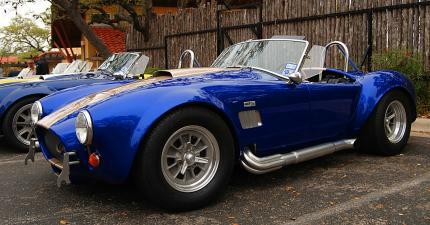 @Viking/Bijan You guys are correct the cobras as of 1967 the last year of the 427 had 425hp a 5 speed and a top speed of 167 mph. @ Viking you are absolutely right, as usual.I think so the 425 gross hp is correct. Yes only the Cobra Daytona coupes could reach 300 kph with full race 289's.and of course the one of the all time Legends : The GT40. @ Mike B , Ya I have them all. you are right about 485 and 425 gross hp .But my problem is : 0-100 kph 3.8 and 0-200 kph 13.0 ???? faster than 1986 Porsche 959 ? These are technical Figures not fantasy . Car and Driver tested the Street/Competition 427 cobra in 1965 or 1966 with 4.11 final ratio and reach 12.4 @ 118 mph , and top speed 134 mph. the std ratio in this car was 3.50 and the others : 3.77,3.89,4.11 and the Top speed of this version about 135-162 mph. @Bijan I completely agree with you, the only Shelby Cobras produced that could and did reach 300 kph were the full race Cobra Daytona coupes. We don't have them on this site of course since all six of them were made strictly for racing. They were very successful, but eventually were phased out of competition in favor of the Ford GT40 models. Looking at this page it appears that there could be some other questionable numbers: 485 hp (I think the S/C had 425 hp gross), 3 speed?. All I could find, but I've been searching for those, do you have them? well that's about my 300km/h top speed comment, I sincerely don't know from where the other figures came from. Sorry but Are you crazy , this car even with full race version never reach to 300 kph. if you please tell me , you bring this numbers from where ? check the 1966 motor trend road test of Shelby Cobra 427 S/C , or Road and Track . 485hp is the power of the competition version, power is 425hp (gross) and the 186mph topspeed was also for the competition version. the shelby cobra held the speed record for 0-100-0 for over 40 years. 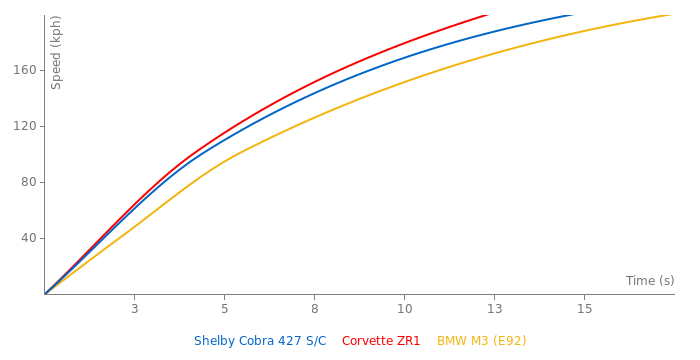 wasn't the s/c (semi competition) cobra detuned to 425 hp? wasnt this the fastest road car ever made for about 20 years, some where between 1962 and 1984 or somthing like that???? and wasnt it the first car to do 0-60mph in under 4 seconds?? ?